Type of Property Covered: Residential And Commercial . Captivating the skills of our professionals, we are involved in rendering Residential Exterior Painting service. Saj Vision Construction Pvt. Ltd.
We are doing all types of interior and exterior painting work with good designs. Art component and creative art inputs that suit the ambience and also reflect each of our clients branding and identity are our forte. So be it creation of a personalized wall mural, custom designed art piece to match a pre-planned interior or providing art inputs for a campaign, ad or event …we do it all in a manner to ensure the output represents the base concept beautifully. Rendering stylishness to any residential area, our offered Residential Painting Services presents a numerous interesting textures, colors and techniques to select from. We use only the optimum quality brands of elastomeric coating and interior paint, which offer protection against mildew, sun, peeling, rain, chipping & other adverse environmental conditions. We are a renowned organization engaged in rendering our esteemed clients with Home Exterior Painting Service. 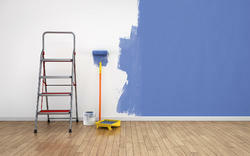 We are counted amongst the most respectable providers of Building Painting services. Our immensely talented professionals use their rich domain experience in ensuring maximum effectiveness with minimum wastage. They allow us to keep the delivery deadlines and thereby support in attaining complete client satisfaction.